Whether you’re looking to save a little time or shake things up by trying something new, there are great ways to increase work productivity with these creative business hacks. These simple tricks and tips will enhance productivity and efficiency in your work day. Boost your fitness and become more alert at work. Not only is exercise smart for your heart and weight, but it can make you better at what you do. Exercise pumps oxygen around your body, feeding your brain as well as releasing happy hormones. Luckily short bouts of aerobics, strength exercises, and stretching in between conference calls can help improve fitness levels and boost productivity. While desk exercises for the cubicle-bound won’t promise six-pack abs, they might just improve strength and burn a few extra calories to boot. Are you getting so many text messages a day that you don’t know what to do? Some may be important and work related but most are a drain of our work time. Stop texters from texting you again and again with this easy trick. 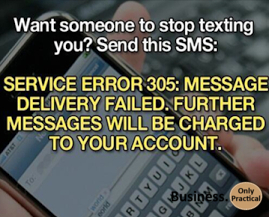 Send them a text back saying, “Service Error 305: Message delivery failed. Further messages will be charged to your account.” That should stop pesky texters from sucking all the time out of your day so you can concentrate on what needs to be done. In a hurry to get to that meeting on time? Try this little elevator hack to speed up you travel time. Once inside the elevator, press “close door” and your floor number at the same time to skip all the floors in between even if someone is calling the elevator. Of course, if you aren’t late, we say take the stairs if possible to get your brain juices flowing by the time you reach your desk (see business hack #1). If you need a form of hands-free talking on the cheap, use this easy tip. Create the ultimate hands free device by converting old cassette tape cases into your mobile phone’s best friend. I’ve even seen a few that are decorated with cheap contact paper to make a personalized statement. In business, we should test everything. If you usually wear a grey suit to the office, try blue instead. If you make sales calls in the morning, try calling in the afternoon and see if you get better results. Just one simple change can create increased results. Speaking in front of others during a meeting can get many employees anxious. When you do have to give that big presentation at work, bring a bottle of water to the podium with you. If you find yourself in a spot where you blank out or someone asks a tough question, taking a drink of water first will allow you to gather your thoughts and none will be the wiser. According to research, people struggle to be creative in a quiet atmosphere. Similarly, they also find loud workplaces distracting. So what’s a worker to do? A happy medium is a gentle sound can be heard in the background. Apps come in handy for this. 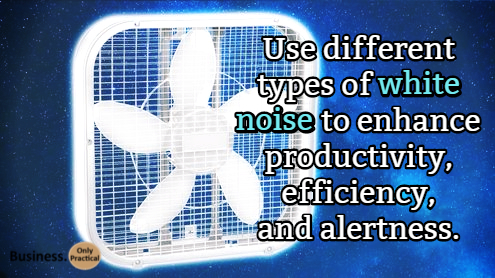 They can transport you to a quiet beach, a relaxing nature walk, or a simple fan noise. What you need is the right noise for the job: ambient sound for creative focus, white noise for tight concentration or more relaxed soundscapes for calm efficiency or relaxation. Of course, you may also need a pick-me-up after lunch. Try hitting the candy bowl. Sure chocolate’s got caffeine, but that’s not the only reason it offers a quick pick-me-up. Flavonoids found in cocoa have been shown to boost cognitive skills and improve mood and concentration. Also, try eating a small piece of candy or chewing gum during a long business meeting to enhance alertness. Add some greens to your office area. In a stuffy office, a houseplant can help filter out pollutants like volatile organic compounds (or VOCs for short). And those chemicals can have both long and short-term effects, including energy-draining allergies and headaches. Add a plant, though, and those threats could diminish. Drink plenty of water. When dealing with the daily grind, it can be hard to remember to drink enough water. 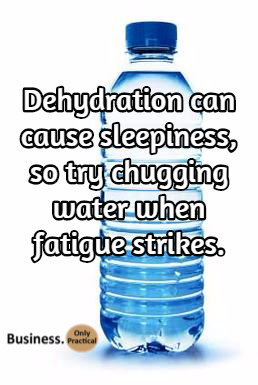 But even mild dehydration can cause sleepiness, so try chugging a glass or two when fatigue strikes. Or, better yet, stay hydrated all day long! Do something interesting. Plan to do the most engaging or interesting task of the day during the sleepiest time of day (typically around 3 p.m.). One study found that being interested in the task at hand makes it significantly easier to stay awake even during down times. So plan your most interesting task for mid afternoon.